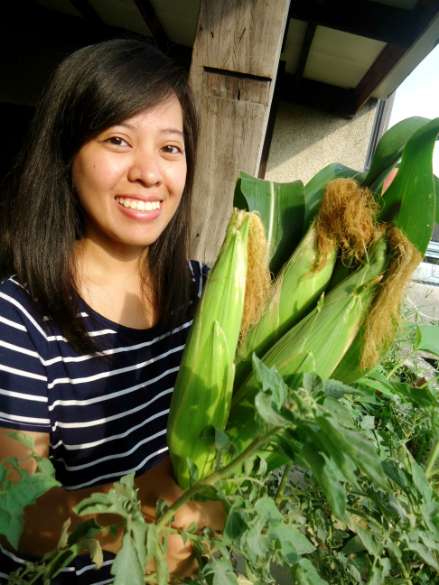 The first thought that entered my mind when I had the idea of growing corn at home was: “Nicole, you have got to be crazy.” Hahaha. Even some of my friends told me that it was a funny and crazy thing to do. 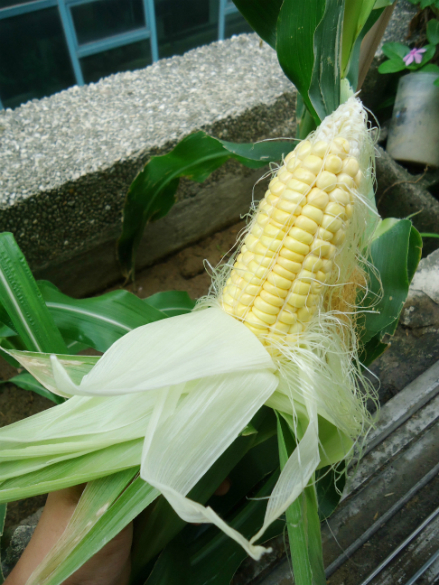 Maybe I WAS crazy because sweet corn is usually grown in fields, not in verandas at home. But, by faith, I still planted seeds of corn and attempted to grow them in the city. For the first month and a half, everything was going “according to plan”. The seedlings were growing beautifully, the corn plants grew taller each week, and there were no bugs or pests around them. 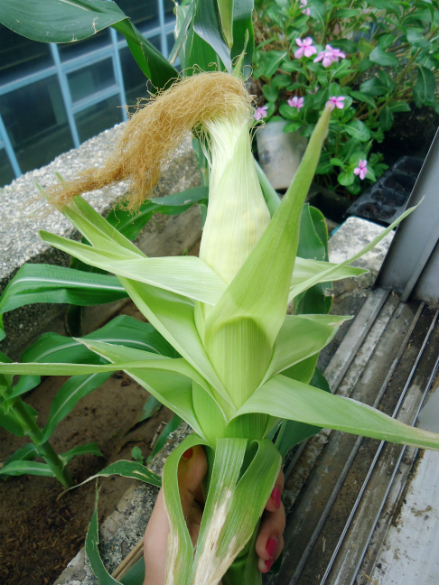 It was also during this time that my first two corn plants produced ears of corn. Compared to my other fruit-bearing plants, this type of plant grew really fast. 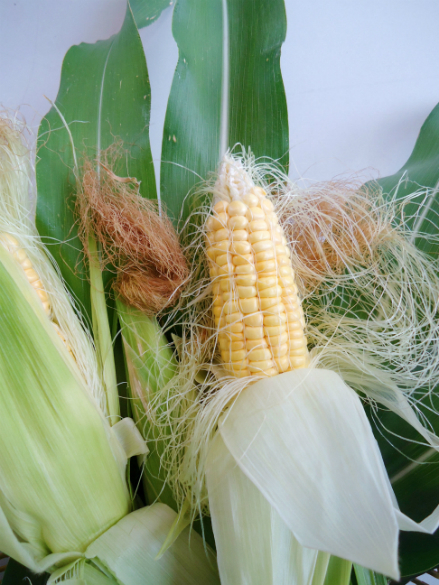 In fact, after I got back home from an out-of-town, weekend trip, my family told me that the ears of corn grew strands of silk hair. I didn’t expect the plants to grow fast, but they did! 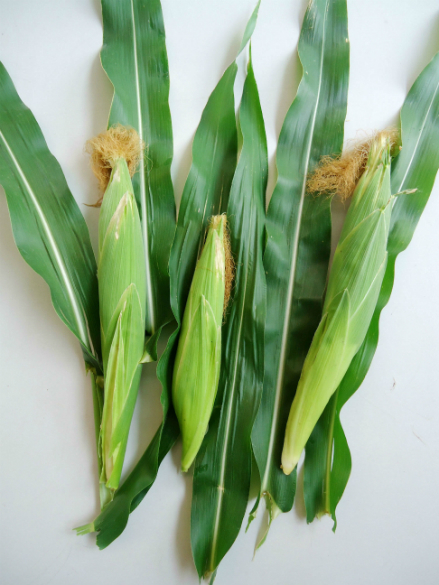 After reading numerous websites on growing corn, I found out that, ideally, corn stalks should be grown in a relatively large area since the more corn stalks there are in an area, the better the cross-pollination will be (which would result to producing kernels in the corn). 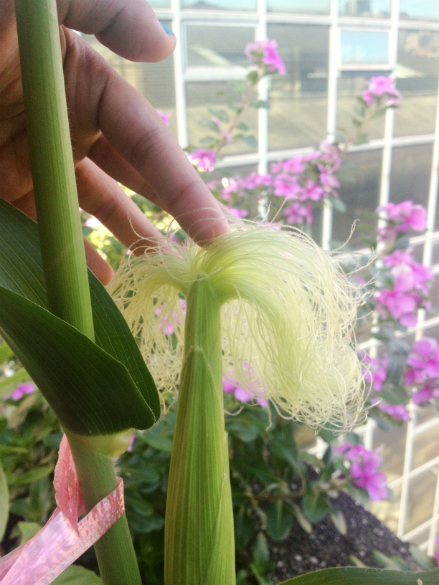 I also learned that each silk hair is connected to a potential kernel and it must be properly pollinated in order for the kernel to grow. Since I live in the city and we only have a limited space to grow plants, my plants couldn’t cross-pollinate, so I needed to pollinate them by hand. I had faith that God can make them grow in our veranda, but honestly, there were times when I would worry about it. Nonetheless, I continued to water and pollinate them everyday. 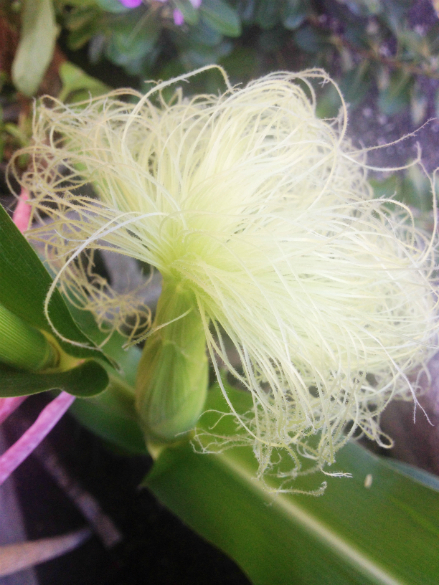 Unfortunately, while I was pollinating the corn plants one day, I made a mistake by covering the tassels too long which resulted to the tassels being wet and useless. I wanted to cover the tassels with a plastic bag so that I could collect more pollen overnight instead of manually shaking them off. However, as a result of my carelessness, the bag got moist and the tassels were drenched. 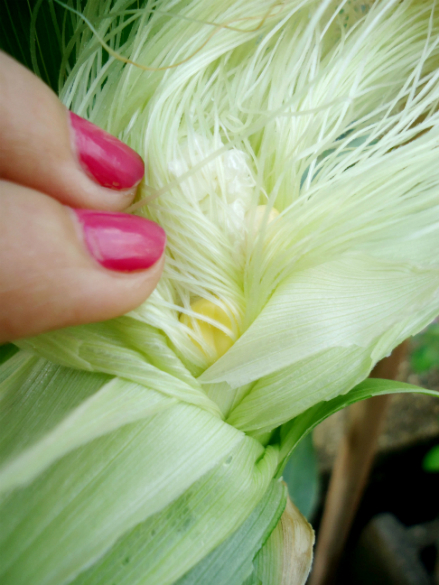 They couldn’t produce pollen anymore which meant that my ears of corn would most probably grow without kernels. You could just imagine how devastated I was. I spent the past two months watering the plants twice a day and I did my best to take care of them. But, I couldn’t undo my carelessness, I couldn’t force my plants to produce pollen again. I felt so discouraged and annoyed at myself. But, by God’s grace, I still had a third corn plant growing beside the other two corn plants. Thankfully, this third plant was a late bloomer. 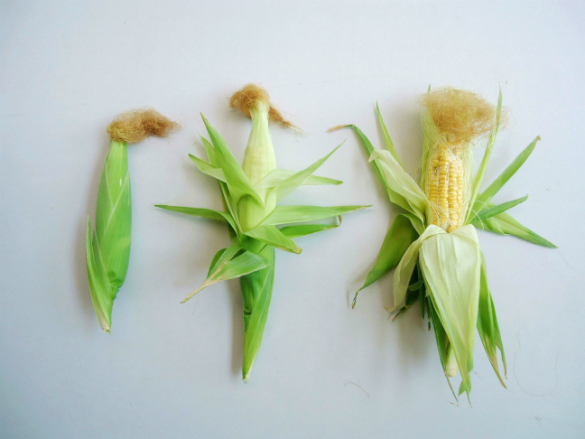 It only developed its tassels and ear when the other two corn plants’ ears were already big. As I looked at the third plant, I noticed that its tassels were generously producing pollen. I then thought of transferring the pollen from that plant to the other two plants. 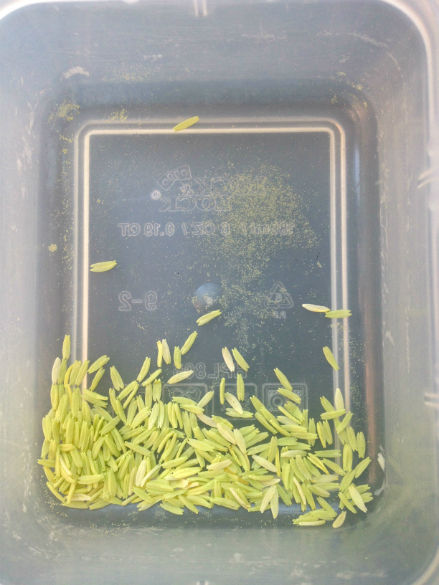 However, I also knew that if I use up the limited pollens of the third plant, there won’t be pollens left for that plant’s ears. 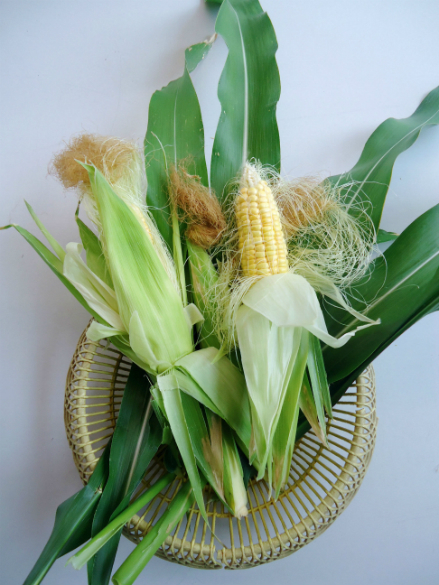 I had to make a decision fast because I only had a number of days because the ears of corn reach their full growth. 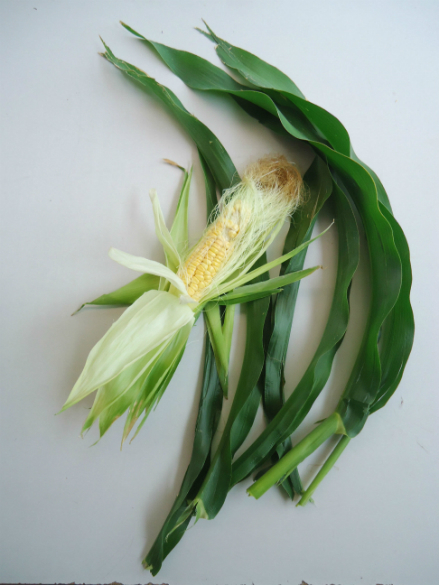 After praying and thinking about it, I decided to sacrifice the life of the ear of corn in the third plant and I used its pollens to help grow kernels in the first two plants. After five days, the third plant’s tassels stopped producing pollen and the tedious hand-pollination process was finally over. 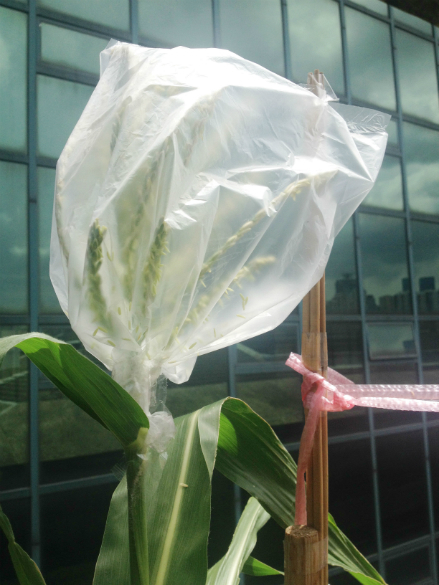 All I had to do was to continue watering the plant and hope that the pollens in them would help grow kernels. About a week later, I checked the plants to see if they were ready for harvest. 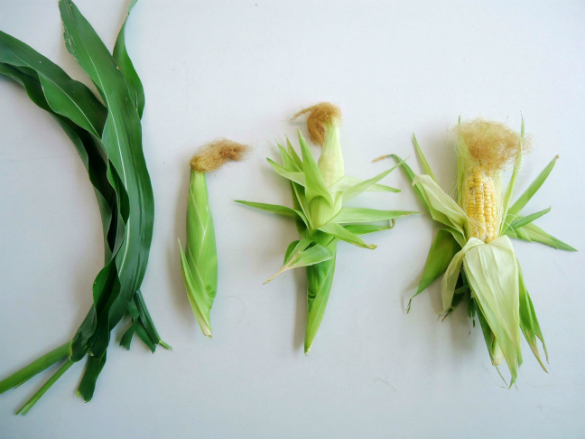 To know if the corn is ready for harvest, you have to check these three things: 1.) The silk hair must be dry and brown. 2.) The ear must be plump. 3.) 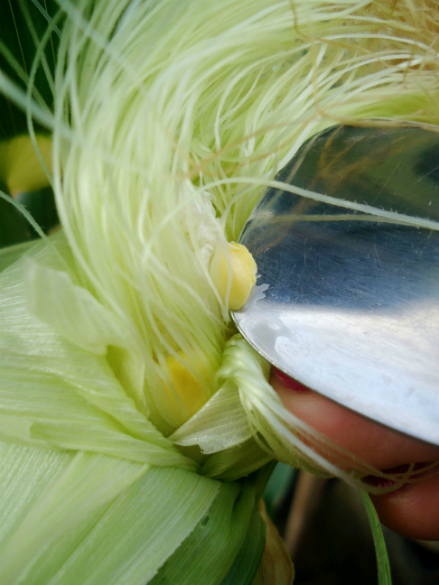 When you poke a kernel found at the top of the ear, it must squirt out a milky liquid, not a clear one. By God’s grace, both ears of corn passed the test! After two and a half months, they were ready for harvest! I couldn’t believe it was finally happening. 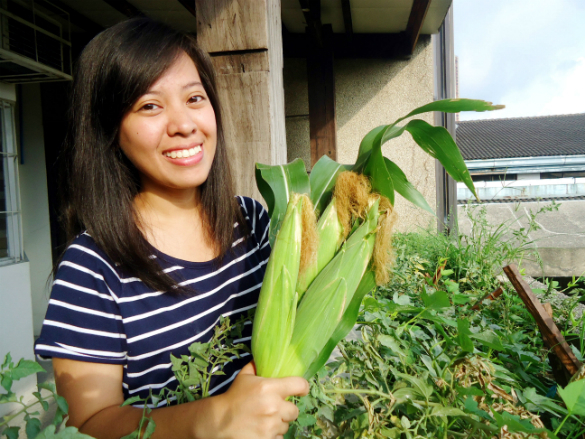 I felt hopeful and nervous at the same time because it was my first time to grow corn. 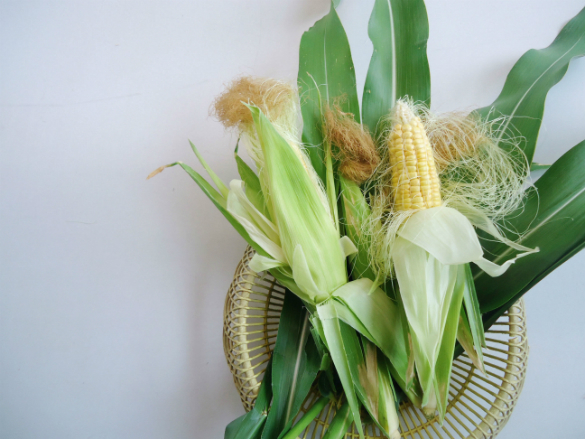 With a grateful heart, I harvested two ears of corn last May 22 and thanked God for the awesome privilege of growing corn at home. 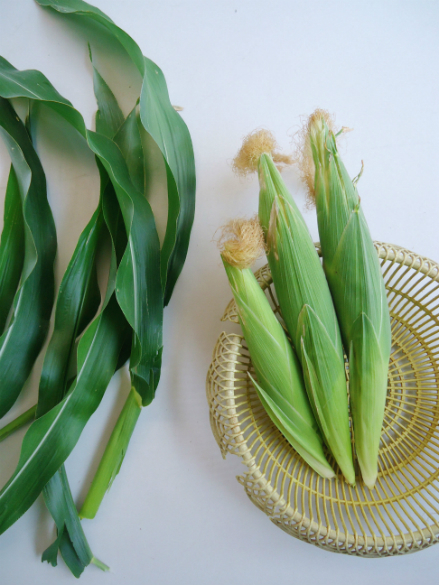 I slowly peeled the layers of leaves and strands of silk hair away from the cobs of corn and I saw beautiful, yellow kernels. Man, that moment was priceless. 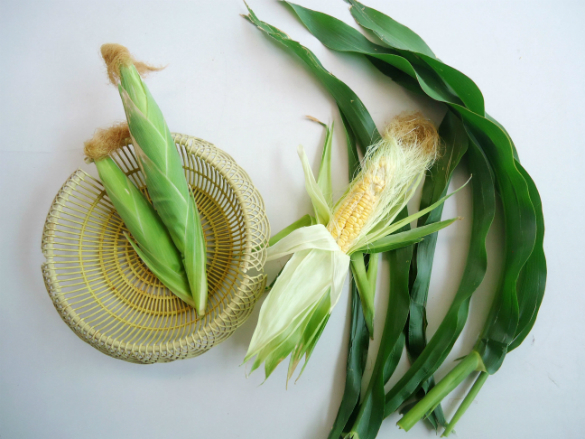 Although one of the ears of corn had only 85% of its kernels and the other ear only had 95%, it was still such a delight to see them grow. Suddenly, impossible things didn’t seem so impossible after all. 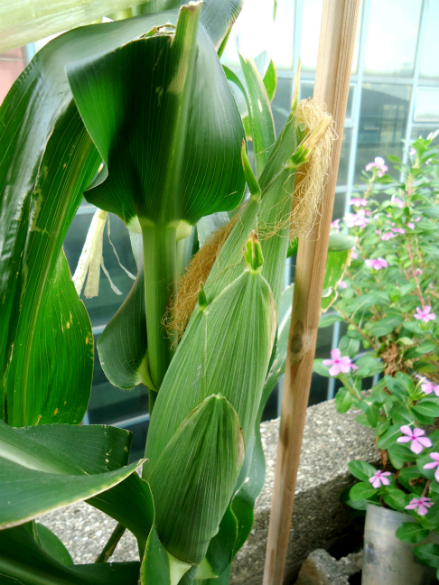 While I was enjoying the moment, I saw the third corn plant in the veranda. I then remembered that because of my mistake, the third plant needed to give up the life of its ear in order for the ears of the first two plants to grow. I shared this to my mom that morning and she told me that it reminded her of Jesus’ sacrifice. It all made sense. When I made a mistake a few weeks ago by leaving the plastic bags on the tassels too long, I couldn’t understand why God allowed it to happen. 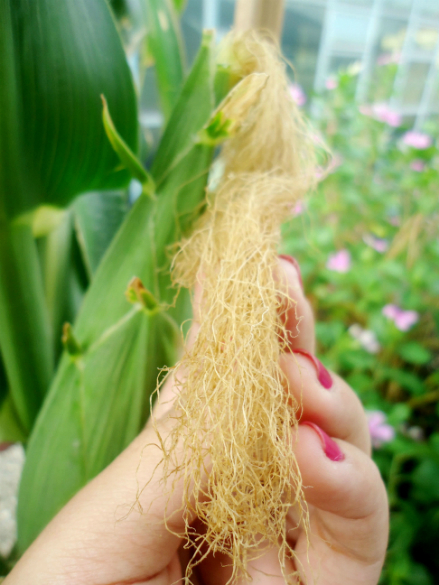 It was so discouraging to make a costly mistake during the most crucial period of the corn plants’ growth. But, now I know that He had a purpose for it. He wanted me to remember the sacrifice that He did thousands of years ago when He sent His Son, Jesus, to die on the cross and to rise again just so we could have eternal life with Him in Heaven. I made a mistake while I was gardening and I definitely couldn’t reverse what I’ve done or save the plants on my own strength. But, God, in His perfect timing, provided a way for me to still pollinate the plants and enjoy its fruit. In the same way, God constantly reminds me that He already made a way for us through Jesus. Because of Him, I know that I have been redeemed from my past wrongdoings; I have been set free from the slavery of sin, and I have been given the privilege of drawing closer to God each day — until eternity. Are there seemingly impossible situations in your life right now? I encourage you to lift them up to God, to do your part, and to relax as you witness Him work in ways that we can never imagine. Encourage yourself one treat at a time.